Even then, I had a reputation for jumping into stories with both feet and with no hesitation, often with my pal, fellow "Postie" Ken Klein at my side. We had become well-known for being quite the double-byline pair on an assortment of off-the-wall stories. This time, I was on my own. It was a story I really, really wanted to do – to go down into one of southeast Ohio's many deep coal mines with a shift of coal miners. There was some trepidation; I knew that it was no place for the claustrophobic and I was just a kid and not sure how I'd react. But I had a personal reason to want to go down hundreds of feet below the surface of northern Appalachia to see for myself. You see, my maternal grandfather, Harrison Ramsey of Todd Township, Fulton County, Pennsylvania, was a miner. 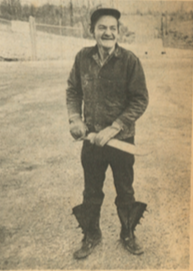 I never met him; he died when my mother was still a little girl in the village of Knobsville, Pa. And the story I had heard was that he died of black lung disease, the scourge of miners laboring in narrow passages underground, in clouds of rock dust. So, while at The Post, I appointed myself the coal mining reporter because the university was smack in the middle of southeast Ohio's deep coal mining and strip mining region. 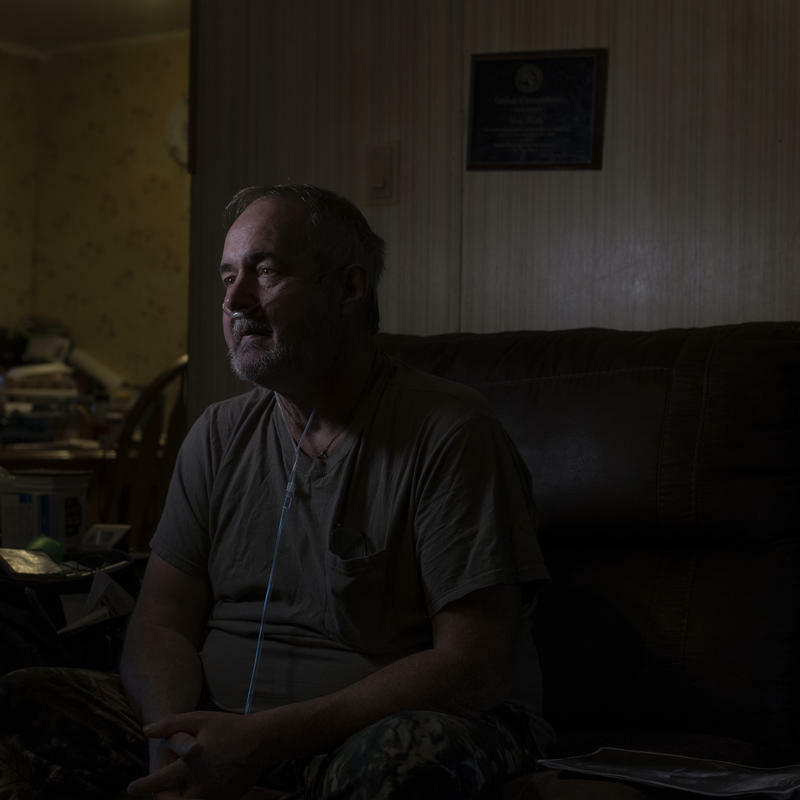 It was a major employer – sometimes the only employer – in the Appalachian counties that surrounded Athens, counties that were plagued by chronic unemployment and poverty. I covered the United Mine Workers' (UMW) strike against the Southern Ohio Coal Co. in late 1974, which shut down the mines for about a month. Call it coincidence if you will, but the UMW strikes almost always coincided with the opening of deer hunting season, and the miners had plenty of time on their hands to roam the hills and hollows of southeast Ohio in search of bucks and does. I had developed good relations with both the coal company and the union. So when the strike ended in December, I asked both Southern Ohio Coal and the UMW if I and two Post photographers could come out to Meigs Mine No. 2 and go down the shaft with the first crew back on the job. To my surprise, both sides agreed. We were to go down with the midnight shift and come up in the morning. The nearest village of any consequence was Wilkesville, 25 miles southwest of Athens, just over the Meigs County line in Vinton County. Vinton County has been, and remains to this day, one of the poorest counties in Ohio. Wilkesville had a population of about 180 back then; it was down to 149 in the 2010 Census. With the deep mines shut down (Meigs Mine No. 2 was closed 17 years ago), there's not much reason to stay. It was a very chilly night when photographers Clif Page and Steve Brezger and I made the drive to Meigs Mine No. 2. We were met by a shift of over 100 miners who were standing outside the entrance of the mine, ready to pile on to elevators. Elmer Cornett, then the safety director for the company, was briefing the men. "You fellas haven't been down there for nearly a month and things aren't exactly the way you left them,'' Cornett said. "You've got to be extra specially careful." "We've done this before, Elmer,'' one miner yelled from the back. As we were lowered down the mine shaft, one of the miners was complaining that the strike was too short. "I only got out deer hunting once, and that was just yesterday,'' he grumbled. "I shot a deer in the foot and had to chase him down and slit his throat." With that image in our head, Clif and I felt the big jolt when the elevator clunked down in the mine floor, the gate swung open, and the miners began piling out – all wearing their hard hats with flashlights on the front to get around in the dimly lit mine. Foreman Lindberg Arnold stood in the dark, supervising the operation. "Oh, hell, Bill," he told a miner who was having trouble with a roof bolter. "You've been doing this for 20 years." Arnold had been a miner for 28 years, and his father was a miner before him. His son was working in a nearby mine. Mining, Arnold told me as he watched coal shoot down the conveyer belt, "is a dangerous business, but it's not as bad as it's made out to be. "When I started out these roofs were held up by big timbers instead of these bolts," Arnold said, his hands resting on the mine ceiling a couple of inches above his head. "Now that was dangerous." We walked down the dark mine shaft and saw a miner coming toward us, gathering trash off the mine floor and sticking it in a burlap bag. "Here you go; look at this,'' Arnold told us. "I want you to meet our female miner." Her name was Tammy Huisinger. "I haven't mined anything yet,'' she said. "All I've been doing is picking up this trash." "Now, you be patient, sweetie,'' Arnold said. "I'm going to dig coal if it's the last thing I do,'' Huisinger said, stabbing a crumpled cigarette pack on the floor. I've thought of her from time to time since then, always hoping that she got her chance to dig coal. When we got near the coal chute, the rock dust became so thick that you could not see the man next to you, only little dots of light from the miners' helmets. As the men dug out the coal, they piled it on a huge conveyer belt to be taken to a large bin. Feeders then push the coal onto another conveyer belt, taking the coal topside. It's the coal dropping from the bins that causes the clouds of rock dust. Breathing the rock dust isn't one of the better aspects of mining, Arnold said. Some men were wearing respirators; others refused. The ones who refuse, Arnold said, "are just asking for it." Finally, we rode in a personnel carrier to another part of the mine for the elevator ride to the top. When we emerged from the mine shift at about 8 a.m., we were met by a large mob of mine construction workers who had gone on strike and were refusing to go back to work. "Hell, if we'd known you boys weren’t going back to work, we would have stayed home too,'' a miner yelled at the picketers as he drove away from the mine. "Well, stay home tomorrow,'' one mine construction worker yelled at him. "This mine is closed." The machete-wielding miner in question. It was bedlam outside the mine. The coal miners and construction workers were in heated yelling matches. One construction worker, clearly drunk as a skunk, wandered around, waiving a machete over his head. A truckload of construction workers took objection to us – "the media" – being present and chased us off the property – with Machete Man leading the charge. We got in Clif's car and, for the next hour, were chased along the backroads of three counties before we shook them on U.S. 50 and wheeled into Athens. And, ever since, I have been grateful that, unlike my grandfather, I've been able to make my living above ground. Honestly, I can't think of any other profession I could have chosen that would have put me in the middle of so many unlikely places and so many historic events.